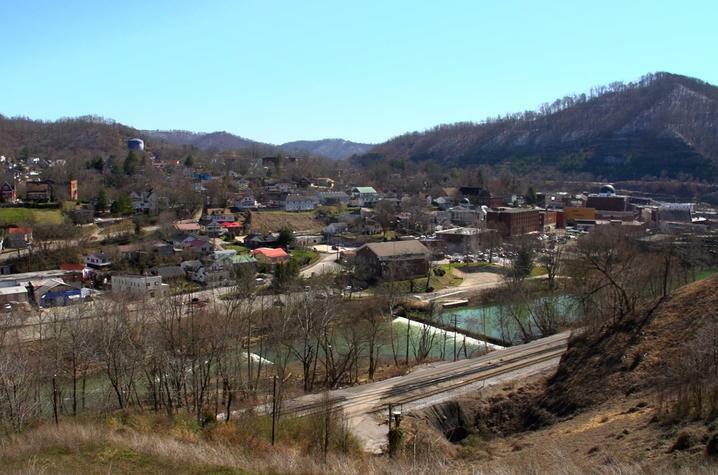 Aerial view of Hazard, Kentucky. LEXINGTON, Ky. (Aug. 7, 2017) — The University of Kentucky was awarded a five-year, $7.4 million National Institute of Environmental Health Sciences (NIEHS) grant to establish the UK Center for Appalachian Research in Environmental Sciences (UK-CARES). This center will foster research across all spectrums — basic, clinical, epidemiological and translational—to identify environmental factors and underlying mechanisms responsible for the disproportionately high incidence of chronic diseases, such as colorectal cancer, lung cancer, cardiovascular disease, obesity and diabetes, in Appalachian Kentucky. The center’s long-term goals are to create strong community-academic partnerships to support meaningful community engagement and environmental health literacy and leverage these community perspectives to facilitate new discoveries that reveal environmental factors in disease initiation, progression, outcomes and community impacts. “UK-CARES will enhance scientific capacity by providing advanced infrastructure and expertise, training and mentorship, and community-engaged interactions—all directed toward the goal of facilitating innovative discovery and new understanding of environmental factors in disease, and toward career development of scientists who are interested in tackling challenging environmental health questions facing Appalachian Kentucky and beyond,” said Xianglin Shi, the William A. Marquard Chair in Cancer Research in the UK College of Medicine who is principal investigator on the NIEHS grant. UK has longstanding partnerships with the goal of reflecting the needs, interests and values of the Appalachian population, Shi said, and UK-CARES builds on those partnerships, including the community-engaged dissemination and health policy research led by Ellen Hahn, College of Nursing, and community-engaged intervention research conducted by Mark Dignan, College of Medicine. Hahn serves as UK-CARES deputy director and leader of the Community Outreach and Engagement Core. Dignan serves as co-leader of the outreach core. The center will foster new interdisciplinary research by supporting work to improve early detection, prevention, and therapeutic strategies for environmental exposure related cancer and disease; by translating environmental research at the cellular and animal level at UK to human studies at the population level; and by using clinical and population-level findings to guide cellular and animal studies to identify biomarkers of environmentally induced disease. UK-CARES will promote collaboration among basic, clinical and population scientists, support early-stage and mid-level investigators in developing diverse professional skills and attract mid-level investigators and scientists in other fields through opportunities to focus on environmentally induced disease. Housed in the Center for Research on Environmental Disease in the UK College of Medicine, this interdisciplinary research center will bring together the expertise of UK investigators in the Colleges of Medicine, Nursing, Public Health, Engineering, as well as the Gill Heart Institute, Kentucky Water Resources Research Institute, Markey Cancer Center, Kentucky Center for Smoke-free Policy, UK Center for Excellence in Rural Health and Kentucky Homeplace in Hazard, Kentucky.